I used to live in Northern British Columbia, in a small town called Terrace. Terrace is about 90 miles from the Pacific Ocean and the end of Highway 16 at Prince Rupert. It is a beautiful part of the world, wild and relatively unspoiled. One of the rituals of living up there is making at least one visit to Hyder, Alaska. If you live in Hyder, there are only three ways to get in or out of the place. By seaplane, boat, or through Canada. There are no American highways to Hyder. The town is right across the Canada/US border from Stewart, BC, near the bottom of the Alaska panhandle. They are pretty much twin towns, except that when you cross into Hyder, you know you’re in a different country. Once you’re there, the tradition is to become Hyderized. What that means is that you have to drink a glass of a nasty hard liquor called Everclear in one swallow, no stopping or gagging. Once you do that, the bar gives you free drinks and you’re officially Hyderized. The town does get its share of tourism, which helps the economy a lot. The people who live there choose to do so because they want to get away from it all. They make a living off the land. They are tough, individualistic, and they don’t cotton to strangers. But they grudgingly accept the tourist dollars. I found this piece on My Itchy Travel Feet to share with you. 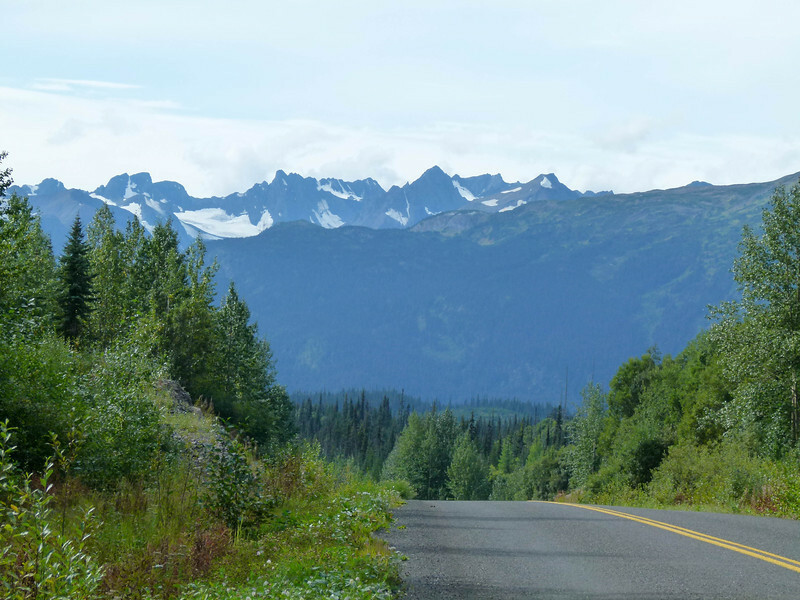 Driving the Cassiar Highway is a fun addition to an Alaska Highway road trip. Do you like traveling off-the-beaten-path? If you’re planning an Alaska Highway road trip, don’t miss driving the Cassiar Highway in northern British Columbia for isolation, scenery and an in-the-middle-of-nowhere vibe. The 450 miles of rugged beauty journeys through northern British Columbia from the Skeena River bridge on the Yellowhead Highway to just west of Watson Lake on the Alaska Highway. When Alan and I were creating our Alaska Highway road trip itinerary, we looked for alternate routes rather than driving the highway end to end. That’s how we came up with the idea of traveling to Port Hardy on Vancouver Island to catch a ride on the Prince Rupert Ferry to Prince Rupert, British Columbia. After a good night’s rest, we’d drive the Yellowhead Highway to the Kitwanga Junction for the turn off onto Cassiar Highway, which is also known as the BC Highway 37 or Stewart-Cassiar Highway. 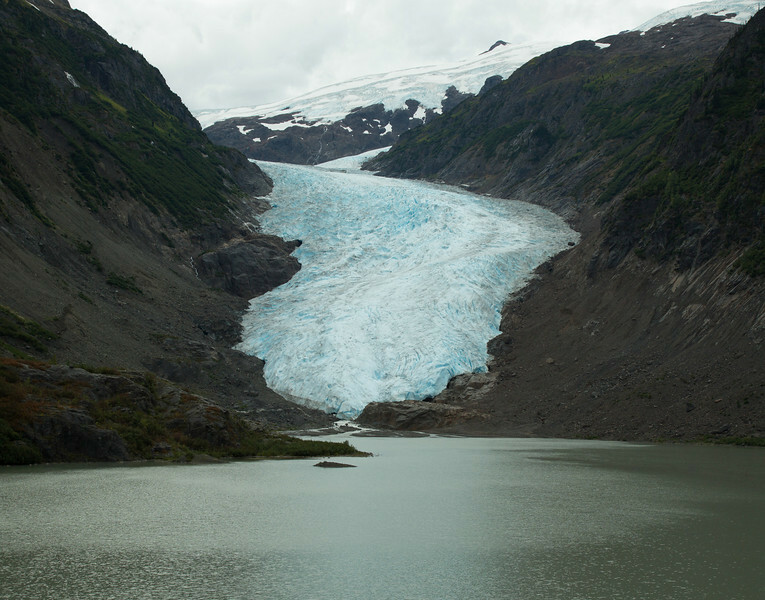 Bear glacier is visible from Highway 37A on the way to Stewart B.C. Following advice we read in The Milepost, Alan and I take the side trip on Highway 37A that runs through a fjord, with close-up views of Bear Glacier, to Stewart, B.C and accommodations at Ripley Creek Inn. From here it’s a very short drive to Hyder, Alaska, and the fantastic wildlife watching at Fish Creek Wildlife Observation Site. On two visits, one in the morning and one in the afternoon, we see a grizzly bear and a wolf. The real driving on the Cassiar Highway begins after returning from Stewart and Hyder to Highway 37. But we aren’t alone. Alan and I happen to be traveling the Cassiar during construction of a major power transmission line. This off-the-grid wilderness is being powered up to accommodate mining and other industrial activities. You can read about the threat to the region in this article at Rivers Without Borders. During the first portion of the drive, we pass numerous roads being cut into the wilderness and staging areas filled with metal towers scattered about the ground looking like giant erector sets that have toppled over. Emergency vehicles are parked alongside the road every few miles. This is one busy road. Boomer Travel Tip: When driving the Cassiar Highway, fuel up at every gas station, because they are few and far between. After leaving the construction area behind, which research tells me is now complete, the road finally meets our expectations of quiet beauty. And we begin to see wildlife, including three bears within a few miles of each other. 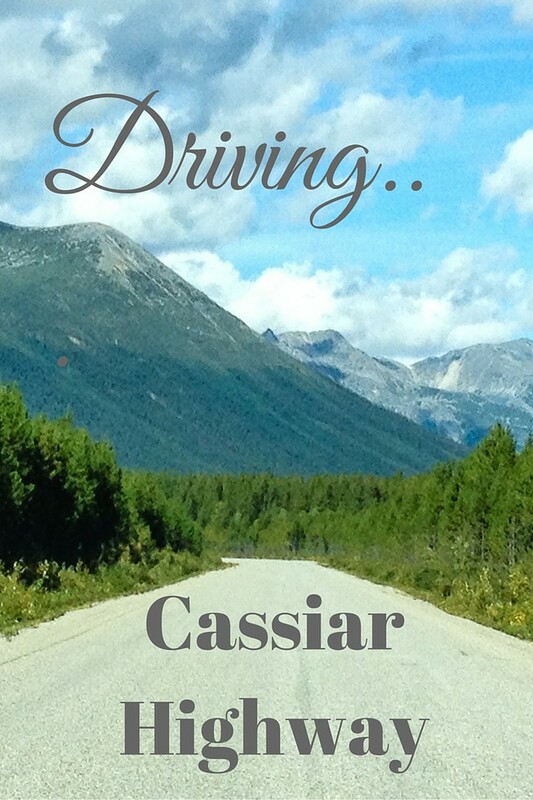 Boomer Travel Tip: Here’s an account of what driving the Cassiar Highway looks like now that the power lines have been installed. Tatogga Lake Resort near Iskut, B.C. 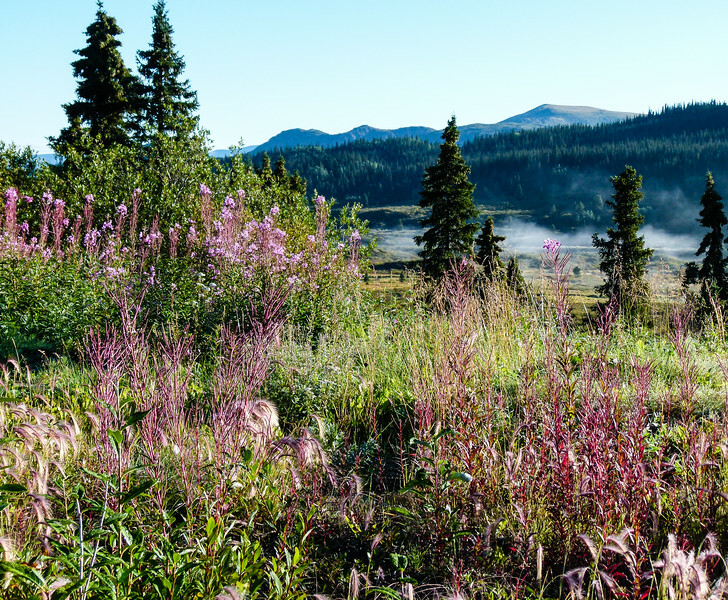 As you can imagine, lodging along a remote highway such as the Cassiar is basic. And there aren’t that many places to stay. This is one time when RV travel or camping offers more choices—but not many. The cute chalets at Bell 2 Lodge look enticing but it has only been a few hours since leaving the Ripley Creek Inn in Stewart. So we continue on to our reservations at Tatogga Lake Resort near Iskut. When Alan drives the SUV into the muddy parking lot at the antler-decorated Tatogga Lake Resort, we suspect a quirky night awaits us. Inside the lobby, a menagerie of hunting trophy’s hang on the wall. There’s even a moose standing near the fireplace. Accommodations at Tatogga Lake Resort include cabins—some requiring a trip to the outhouse—RV spaces, campsites and a motel. The cast of characters definitely makes up for the basic motel room where Alan and I spend the night. Dinner at the “resort” is served family style. But the fun part is the conversations with other guests as we sit in the lounge trying to log onto the free Internet. Professional kayakers from around the world trade working at Tatogga Lake Resort in exchange for the opportunity to hone their whitewater skills on the Stikine River. Sitting in the lounge, we hear accents from Australia, Spain, and New Zealand. And watching over the shoulder of a videographer editing a whitewater kayaking video convinces us that many portions of the Stikine require great skill. If you’re curious to learn more about the Stikine, this Matador article describes kayaking the Stikine and the challenges the headwaters region faces from industrial development. Don’t miss watching the video. I wonder if it was the same one I saw being created in the lounge at Tatogga Lake Resort? 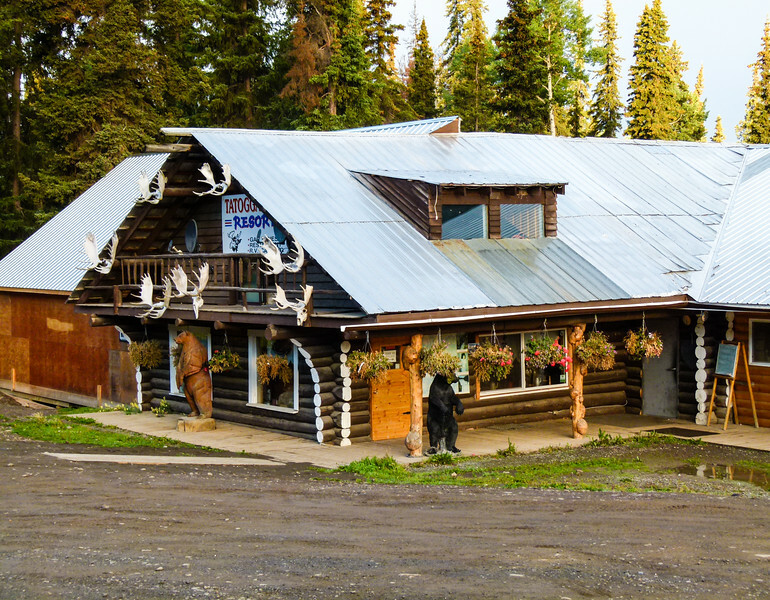 Located between Mount Edziza Provincial Park and Spatsizi Plateau Wilderness Provincial Park, Tatogga Lake Resort makes a fine headquarters for outdoor adventure along the Cassiar Highway. Although we don’t have time to participate on this road trip, Alan and I would like to return for a floatplane tour over the volcanic cones of Mount Edziza or along the Grand Canyon of the Stikine. And a guided wildlife-watching hike in Spatsizi Park, considered the Serengetti of the North due to prolific wildlife, is on the list, too. My best dining advice for the Cassiar Highway is to bring your own food and cooking facilities, uh, RV. And like the tips for finding gas, if you pass by a business that serves food, stop and enjoy a bite because it can be many miles until the next eatery. As I mentioned earlier, we ate lunch at Bell 2 Lodge and then dinner at Tatogga Lake Resort. After the one-night stay at Tatogga, we depart early, stopping at Rumor’s Café in Dease Lake (no longer in business) for breakfast. Boomer Travel Tip: For an adventurous drive, take the Telegraph Creek Road junction at Dease Lake for 71 miles on a very steep, windy road to historic Telegraph Creek. The round-trip journey takes at least a day. Next time we’re doing it! The Cassiar Highway views become even more beautiful after Dease Lake. After Dease Lake, driving the Cassiar Highway meets our expectations as the road narrows, has no center line, or shoulders. Now this is driving in the wilderness! As our SUV crests a hill, lakes shimmer in the morning sun, while autumn wildflowers color the shore a rusty red. 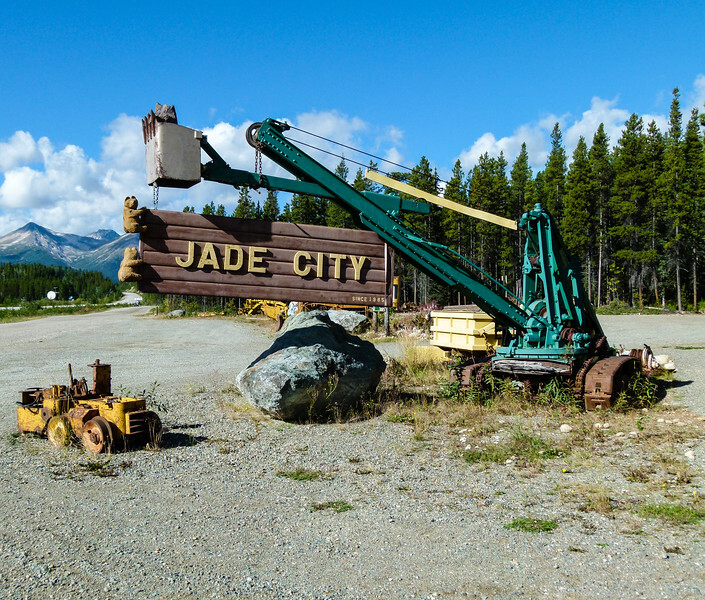 Of course we stop at Jade City to check out the quirky Cassiar Mountain Jade Store. Twenty to fifty hardy souls (depending on which source that you believe) make Jade City their year-round home. By mid-afternoon, Alan and I trade the rugged Cassiar for a first look at the Alaska Highway. At the junction, we turn west on the Alaska Highway and head for Teslin.